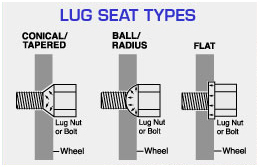 There are 3 major types of lug nut types: Conical tapered, ball radius, and flat seat. Most aftermarket wheels require the use of different lugs to match the seat of the new wheel. Failure to use the proper lugs nuts may cause your vehicle to vibrate and could cause the lug nuts to loosen over time. At Town Fair Tire we take the worry out of aftermarket wheels. Purchase a set of wheels from us and we will include the proper lug nuts at no additional charge. Then we will mount your new wheels on your vehicle and hand torque the wheels to factory specifications. Town Fair Tire recommends your new wheels be re-torqued after a break in period of 25 miles, another free service at Town Fair Tire. Important! Your spare tire requires the use of factory lug nuts. Town Fair Tire recommends you save your original lug nuts in the spare tire compartment so they will be available should you ever get a flat tire. It is always a good idea to keep a set of factory lugs available for your spare tire, which would require the factory lugs.